Dr. Keon Sang An spent a number of years in Seoul as a pastor, training people for missions before entering the mission field in Eritrea and then Ethiopia. Over the years, Dr. An studied at various seminaries in Korea, England, and the United States, including right here at Fuller. While on the mission field in Eritrea, Dr. An met and married his wife. They raised their family for a number of years in Eritrea, Ethiopia and Seoul before coming here to teach at Fuller. Dr. An’s missionary experience encompasses time as both a single and a married missionary. Through those very different experiences, Dr. An offers a few insights for SIS students (or anyone) preparing for life on the mission field, whether for the first time or the tenth time. Dr. An and his wife began their marriage in Eritrea, as missionaries. Not only were they adjusting to marriage and each other, but they were doing so in an unfamiliar context, which made it especially challenging. He believes that marriage is a mission field, in the sense that it is two different people coming together, seeking to learn from and understand one another. No matter how similar any couple’s background, family or culture, there are still distinctions that need to be humbly and graciously learned and worked out in married life. To do so while trying to adjust to the mission field is doubly challenging. If you are getting ready to leave for the mission field, wherever that may be, and are also newly married or about to get married, consider spending some time in your home context first. Theology and missiology are contextual. All theology is contextual in nature, therefore, missiology is a contextual theology. The mission field will impact your perspective on the world, God and yourself. Be open and ready to see the ways in which it does so. God is working much more deeply and widely than we often understand. Prior to the mission field, Dr. An had studied the Protestant church, Presbyterian theology, and Calvinism, which encompassed his understanding of theology. After the mission field—its challenges and beauties, and the contexts of different countries—Dr. An views God’s mission as much wider and deeper than his own narrow missiology. Dr. An experienced deep friendships with locals in Eritrea and Ethiopia. Their faithfulness, love and support created family-like friendships, and they taught and challenged him in his faith. These relationships were so precious to him on the field, and they demonstrate his theology of friendship. “We so often talk about incarnational ministry, which sounds wonderful; however, only one person can truly be Incarnate—Jesus Christ. So, practically, what does it mean to live like Jesus among the people to whom we are ministering? We cannot be like the nationals; they do not expect us to be just like them. Even Jesus kept his identity as God; he kept his divinity. If we try to be just like the people in a context, we will fail. We will disappoint ourselves and disappoint the people. But, we can befriend one another. Friendship is the key. Enjoy life in the context you enter. Enjoy friendships there. Out of those friendships, God will work.” Dr. An has learned that wherever he goes—mission field or not—friendships are integral to his joy, values and lifestyle. It is in friendship that we live out Christ’s love for others. 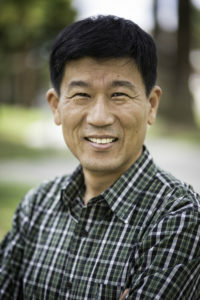 Dr. Keon-Sang An, Associate Professor of Bible and Mission in Fuller’s School of Intercultural Studies, is an ordained pastor, belonging to the General Assembly of the Presbyterian Church in Korea (GAPCK). He previously served as a missionary in East Africa, working with Serving in Mission (SIM) and Global Mission Society (GMS). He taught theology and missiology at Kale Hiwot Ministry Training Center (KHMTC) in Asmara, Eritrea, and later at Evangelical Theological College (ETC) in Addis Ababa, Ethiopia. His wife, Mi-Young, taught psychology at ETC.